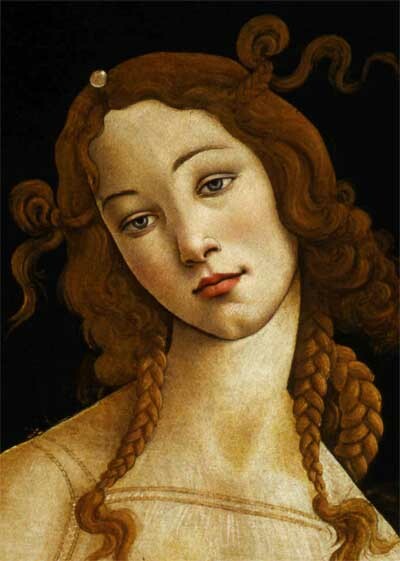 Sandro Botticelli, Venus, ca. 1484 -1490. Tempura on wood panel. WILLIAMSBURG, Va. (CNS) — The culture wars of today have nothing on those from Renaissance times. In Florence, Italy, in 1497 — after people had been repeatedly warned that some instruments, books, sculptures, paintings and clothes could lead them away from their faith — thousands of these items were thrown into a huge pile in the center of the city and burned in the famous Bonfire of the Vanities. Museum goers were sure to pick up more than a few facts about Botticelli, whose given name was Alessandro Filipepi. He lived from 1445 to 1510 and spent most of his life in Florence except for the year he spent painting frescoes in the Sistine Chapel. The wealthy ruling Medici family, before they were overthrown, sponsored his works during the height of his career. Spike said he specifically divided the works into three sections to tell the story of the artist’s journey. The first room centered on Botticelli’s early years and the styles, particularly of the Madonna and Child that he learned from Filippo Lippi. The second room included Botticelli’s top works with paintings of mythology such as “Judgement of Paris” and “Venus,” which is a smaller version — one of only two in existence — featuring the goddess from his famous “Birth of Venus” displayed at the Uffizi Gallery in Florence. To get to the last room, museumgoers passed a cutout wooden sculpture, “Christ Crucified.” Spike said the image, not marred by the brutality of the crucifixion, captures male beauty and has been described as one of the artist’s greatest pieces of sacred art. The last room contained a small selection of the artist’s little known later works. These were painted in the years just prior to Botticelli’s death, after the fall of the Medici family and the death of the angry preacher Father Savonarola. The paintings are more austere than his previous ones; subjects are more serious and the colors are darker. Clearly something has changed in the artist’s overall style. The “Madonna and Child,” displayed in the exhibit’s last section, does not evoke any of the tenderness of the Madonna in the previous room. In this painting, there is no fruit, no open book on a table, no touches of gold or bright blue paint. Mary’s eyes are nearly closed and Jesus is not looking at his mother but looking away. Even more jarring may be the work “Madonna and Child with the Young Saint John the Baptist” where Mary appears to be handing her infant son to John the Baptist. The characters here are large and their eyes are closed. Spike pointed out that Mary, who is leaning over, would not even fit in the frame if she were to stand up straight. For Spike, the collection worked as a whole, but he never pinpointed exactly what he hoped viewers would walk away with, leading this reporter to think the paintings reflect the full package of faith: the comfort and beauty it can give along with the unavoidable and difficult challenge it poses.